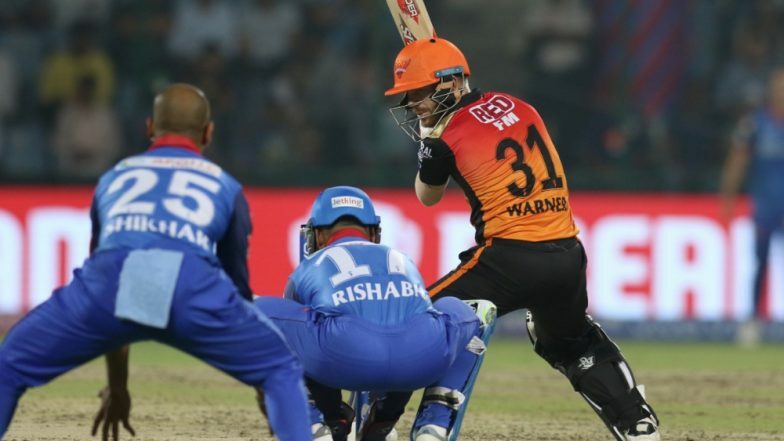 SRH vs DC, Head-to-Head Record: Ahead of IPL 2019 Clash, Here Are Match Results of Last 5 Sunrisers Hyderabad vs Delhi Capitals Encounters! The Sunrisers Hyderabad have seen their campaign hit by a couple of losses that has halted their movement north in the points table. Their latest defeat was a six-wicket loss against Kings XI Punjab in which their batting wobbled once again. Over-dependence on openers David Warner and Jonny Bairstow seems to be their real problem and one that needs quick fixing. They welcome Delhi Capitals who come on the back of a morale-boosting win over Kolkata Knight Riders in the iconic Eden Gardens. Both Hyderabad and Delhi have played each other on 13 occasions with Hyderabad leading Let us look at their last five encounters. Sunrisers Hyderabad vs Delhi Capitals Live Cricket Score. Delhi batted poorly in the first innings with none of the batsmen barring Shreyas Iyer looking to get themselves in on a tricky wicket. This resulted in the host getting just 129 on the board batting first which made their lives difficult. Although SRH did lose five wickets, the target was never challenging and they got home in the end. When Rishabh Pant is on song, then there is hardly any bowler in the game that can contain him. The Delhi wicketkeeper finished with 128 off just 63 balls that included 15 fours and 7 sixes helping Delhi reach 187/5. But the home team’s bowlers fumbled in the second innings as local boy Shikhar Dhawan and Kane Williamson made sure SRH had no problems chasing down the target. IPL 2019 Points Table Updated: RCB Open Their Account on Indian Premier League 12 Team Standings With Win Over KXIP. Delhi knew they did not have enough runs to play with when they put on 163/5 batting first on a Hyderabad track that was good for scoring big. Prithvi Shaw top-scored for the visitors with 65 and was assisted well by Shreyas Iyer’s patient 44. Alex Hales, Shikhar Dhawan, and Kane Williamson all got good starts which was enough for Hyderabad to register an easy win. Corey Anderson and Chris Morris were the stars of the show for Delhi with the bat as they chased a tricky target of 186 set by Hyderabad. Pacers Bhuvneshwar Kumar and Mohammad Siraj did try and pull back Delhi in the second innings picking up a few crucial wickets but in the end, there were just not enough runs to play with for the visitors. IPL 2019 Schedule in PDF: Download VIVO Indian Premier League 12 Full Timetable With Fixtures, Matches, Team and Venue Details. A competitive game between two good batting line-ups but in the end, it was the home team that did enough to get the two points. Kane Williamson slammed 89 and Shikhar Dhawan came up with 70 as Sunrisers Hyderabad piled on 191 on the scoreboard. For Delhi, the efforts of Shreyas Iyer were not enough as they left themselves too much to do in the end. Sunrisers Hyderabad are going through a bad phase which is not good going into the business end of the tournament. Delhi Capitals will fancy themselves to win on enemy territory.